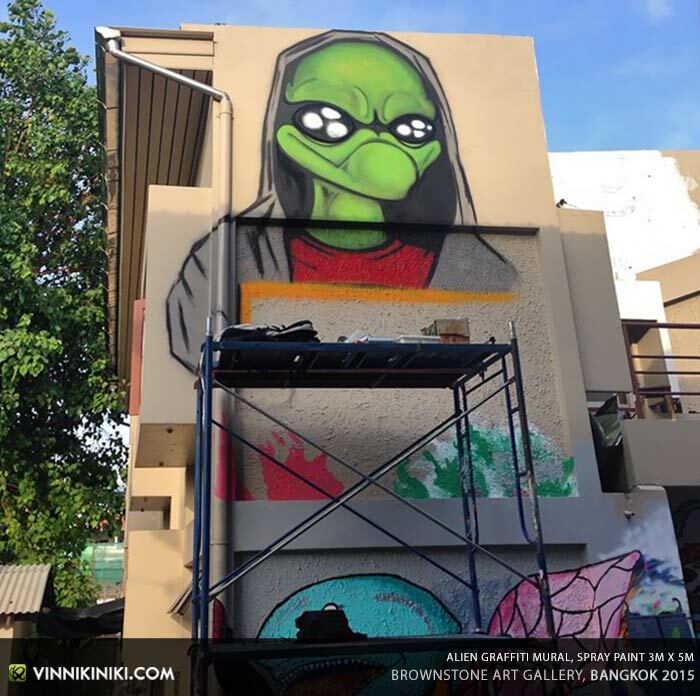 It was super nice to be invited to paint an alien graffiti mural at the Brownstone art & music studios in Bangkok, as part of their ‘recharge’ all day live painting and music event. 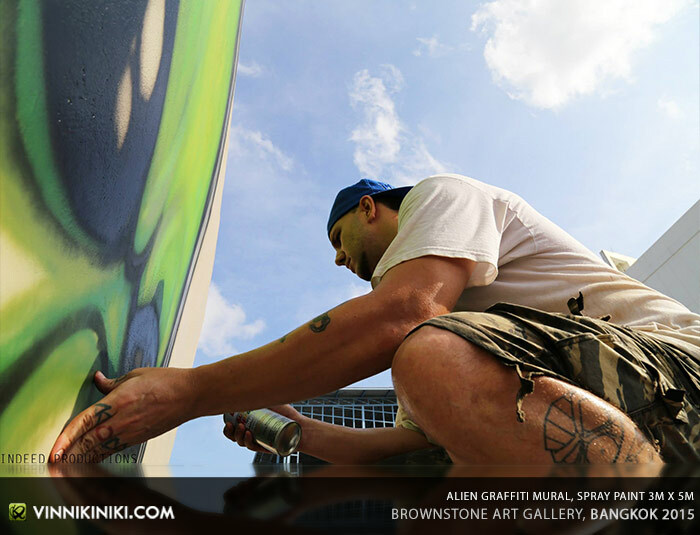 The premise was simple; the gallery invited Bangkok graffiti artists to paint and graff up the exterior walls of the building while bands and musicians were performing live music. Basically an art meets music mash-up featuring some cream of the crop from Bangkok’s music and art scenes. The venue is really cool and after the event looks really colourful with almost every inch of wall space painted up with street art and graffiti murals. 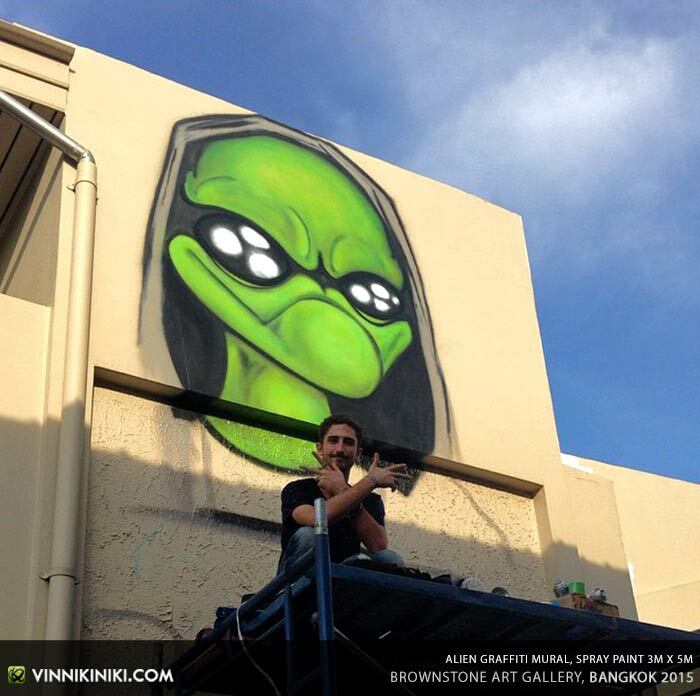 The graffiti mural I painted features a large 6 meter high and 3 meter wide alien character. He or she, hard to tell with alien races, is wearing a hoody holding what looks like a cardboard sign promoting the spread of peace, love and happiness. 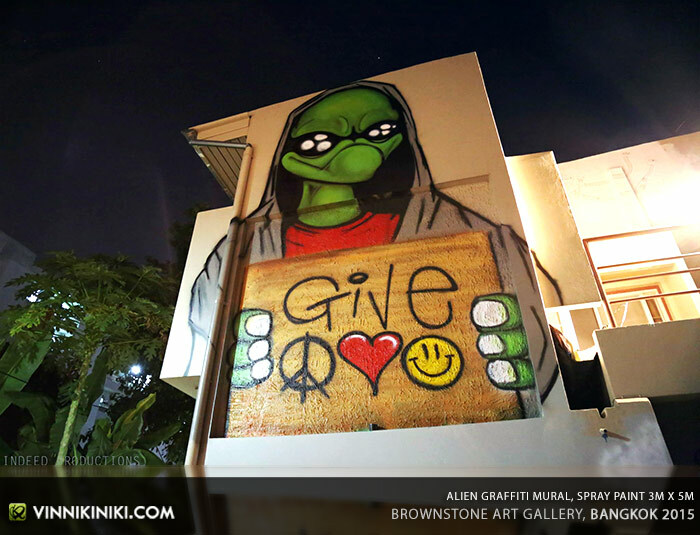 Couldn’t agree more with the alien’s sentiment really… Peace, love and unity man! The mural was a little bit tricky to paint. The space I was invited to paint was positioned above another artist’s mural. This meant the starting bottom level of my painting space was set at some 2 meters above ground, which meant scaffolding was essential for the job. A cherry picker would’ve been ideal but having to paint from scaffolding was surely better than having to use a ladder such as when I painted this tropical beach graffiti mural. Either way painting in the scorching Bangkok heat always turns into somewhat of an endurance and stamina challenge, coupled with the constant moving and re-shaping of the scaffolding structure lead to one hell of a paint session. The work took around 6 hours to complete with small breaks here and there. I used the old faithful spray paint brand of choice out in Thailand; Leyland. It’s really cheap paint, working out to around 1 quid (English) a can. 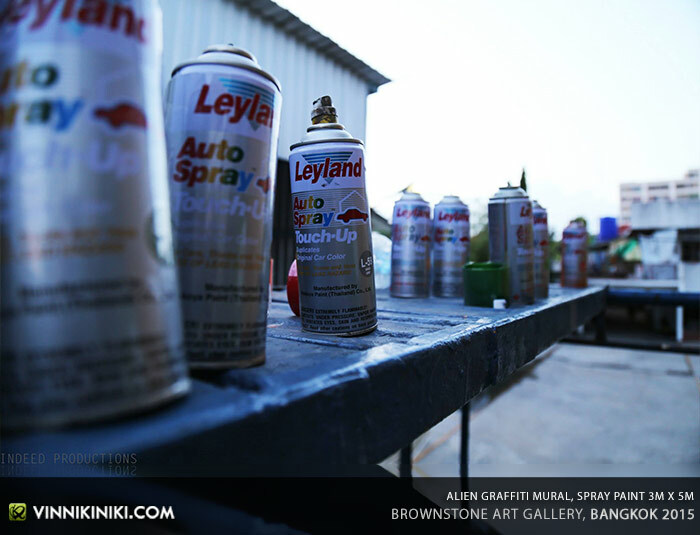 Leyland spray paint has got a fantastic colour range which makes it great for using to paint arty graffiti mural pieces and though it’s a male valve, if you get the right spray caps the paint pressure flow is not bad either. I’ve been painting a lot of UV reactive murals recently (black light art), so it was nice to get back to painting with some normal ‘daytime’ spray paint colours. And always, if you would like to contact me about painting at your gallery or venue please get in touch via the contact artist page. Thanks for checking out, leave your comments below, look forward to hearing from you soon!